Central Jakarta Population and Civil Registration (Dukcapil) Sub-dept. 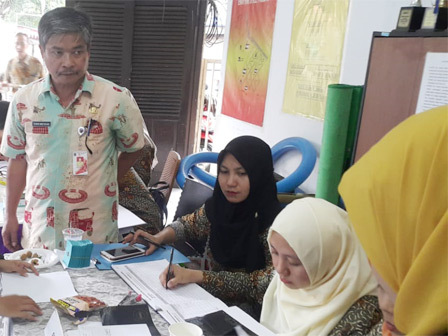 issued temporary domicile certificates for 89 residents of RW 05 in Paseban Urban Village, Senen, while conducting population operation (Binduk) because they don't have Jakarta ID.
" There are 21 men and 68 women who have ID outside of Jakarta"
"There are 21 men and 68 women who have ID outside of Jakarta. On the location, we make SKDS for all of them," informed Remon Mastadian, Head of Central Jakarta Dukcapil Sub-dept. Head, Friday (6/29). According to him, this operation is done by 60 joint personnel from Dukcapil Sub-dept., Social Sub-dept., Public Housing and Settlement Sub-dept., Satpol PP, TNI, Police, urban village and neighborhood administrators. Meanwhile, Senen Urban Village Head, Munjir stated, that location is selected for operation because there are many lodgings and rented houses. "Most newcomers are came from regions outside Jakarta based on collected data," he conveyed.